Read about us in the Times! The New York Times, that is. Last Friday’s paper featured a column in the Art and Design section about historic sites interpreting slaves and servants in addition to the homeowners. We are mentioned and there are audio links to an actor speaking the words of Paul Jennings; this is the same audio which you can hear during tours of the house. 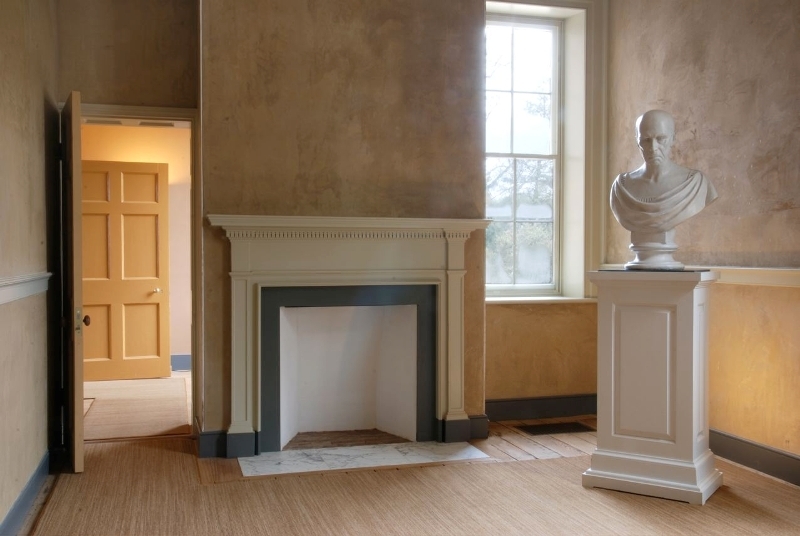 The first recording, “I was always with Mr. Madison,” can be heard in Mr. Madison’s study (M104), the room in which Madison died. Jennings was a slave of the Madisons who worked in the White House during Madison’s presidency and later returned to Washington, DC, with Dolley Madison after James’ death. It was in Washington that Jennings earned his freedom. At the end of his life, an interview with him was turned into a short book, A Colored Man’s Reminiscences of James Madison. Our own Beth Taylor is currently conducting extensive research into the life of Paul Jennings; you can buy a copy of A Colored Man’s Reminiscences in our gift shop to help support her research. All of the shutters have now been fitted, hung, and stamped with their location information. However, before we can hang them permanently, they need a little more work. We are sending them off to have all newly cut and fitted edges primed and top-coated and for all shutters to receive a copper cap, to get a final coat of paint, and then dry over the next couple of weeks. We will let you know when they come back and are hung again. Another area of research we are investigating is court records. These can be helpful in a number of ways: to find lists of Madison property; track family inheritance and land ownership; and trace social and business connections by looking at who was involved in suits with, or against, the Madisons. We started by looking at the records for the county in which Montpelier is located – Orange County, Virginia. The county courthouse has copies of the original deed and will books, which recorded the wills, inventories, and deeds of sale for the whole county. However, we are also searching through court proceedings to find mentions of the Madisons, some of which were moved to Richmond during the 20th century. There is a lot of material to sift through, complicated by the fact that how courts were organized changed more than once during James Madison’s lifetime. So far we have found some good leads, which are followed up by even more research in the court records! This entry was posted on Thursday, June 18th, 2009 at 2:14 pm and is filed under Curatorial. You can follow any responses to this entry through the RSS 2.0 feed. You can leave a response, or trackback from your own site. Perhaps may all find a moment of silence or reflection in remembering this day and the obelisk that stands tall and strong above Madison’s grave there at his home, Montpelier in Orange County, VA. Most Sincerely, I am Yr. Obt. Srvt. Not many people know what is being shared here. Thanks for sharing it with us….